TuneupMyMac is a potentially unwanted application that was designed by Systweak Software for Mac operating systems. The fake system optimizing utility claims to clean, free up space, speed up, and maximize macOS performance in just one click. However, this shady application is known to be spread via software bundling and usually starts performing system scans without user consent. 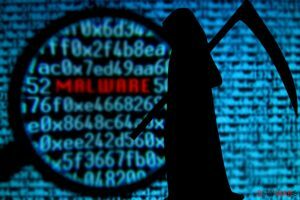 After the full scan, TuneupMyMac virus will show a variety of problems that are displayed in a manner which would make many users worried – especially those who are not that familiar with computing technologies and their operation. However, most of the issues found are insignificant or downright harmless. Nevertheless, because such entries are presented to the user as serious problems, they might get lured and buy the full version of the TuneupMyMac – that is the precise goal of this PUP developers. 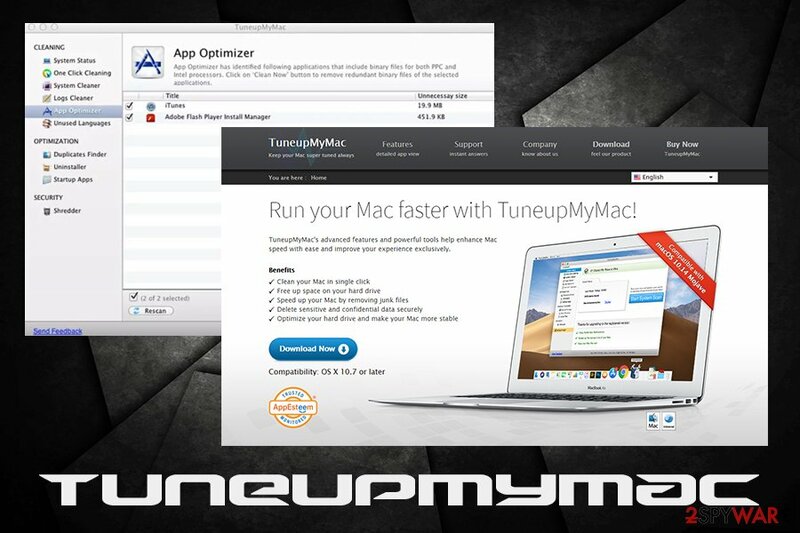 TuneupMyMac, just as many other fake system optimizers (Auto Mac Booster, Mac Tweak, Mac Cleanup Pro, etc.) relies on not so apparent scam tactic: it shows fake scan results in order to frighten to end user and make him or her to pay for the full version of the application. While it is not as treacherous behavior of those of tech support scam crooks, users are constantly complaining about difficulty contacting support when problems arise or even when trying to perform TuneupMyMac removal. Besides luring users money away, TuneupMyMac might also create problems on the Mac operating system. For example, it might delete entries that are vital for other application operation. Therefore, this app not only makes you spend money on useless services but might also be difficult to terminate. If you follow our instructions below, you should be able to remove TuneupMyMac without too many troubles. If you want to recover from the PUP infection promptly and speed up the operation of your Mac, download and install Reimage. It is a well-known fact that all third-party websites that host free software take up software bundling schemes. It is an alternative way to monetize and allow users to use the applications for free. Unfortunately, such business model raised eyebrows of a variety of security experts, as optional applications are often hidden out of sight from users. Tricks like fine print, misleading descriptions, grayed out Skip buttons and similar techniques are used to make users install potentially unwanted programs. In fact, pay-per-install method rewards both parties – freeware authors and third-party owners. Therefore, it is vital to be able to distinguish between legitimate apps and those that do not care about the end-user experience, but instead spam them with ads, display fake scan results and apply similar deceptive tactics. If you are installing an app, you never heard of before, read online reviews or forum posts – those are usually a great giveaway. Additionally, when performing the installation of any type of software (even if you paid for it), make sure you pick Advanced/Custom settings to make sure that no optional programs are inserted into the installer. In fact, Recommended mode is one of the biggest reasons why users end up installing PUPs on their systems. As we already mentioned, a simple Google search will quickly show you if the application is trustworthy. However, if the unwanted app entered without you noticing, you should take care of TuneupMyMac removal, as it is not going to disappear, as it will be launched every single time you boot your computer. Then go to installed Applications folder and move TuneupMyMac to Trash. Alternatively, you can terminate all the unwanted applications with the help of a reputable security application that focuses on potentially unwanted programs. After that, we highly recommend using Reimage to make sure your operating system is in good condition after the infection. 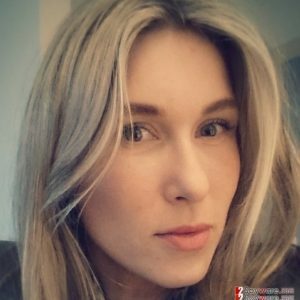 ^ TuneUpMyMac a fraud? Malware? Help!. Cnet. Product reviews, how-tos, deals and the latest tech news. ^ Senzavirus. Senzavirus. Security experts from Italy. This entry was posted on 2019-04-16 at 07:49 and is filed under Mac Viruses, System tools, Viruses. You can quickly scan the QR code with your mobile device and have TuneupMyMac manual removal instructions right in your pocket. How did you remove TuneupMyMac?